Blurb Description: In The Graces, the first rule of witchcraft states that if you want something badly enough, you can get it . . . no matter who has to pay. Everyone loves the Graces. Fenrin, Thalia, and Summer Grace are captivating, wealthy, and glamorous. They’ve managed to cast a spell over not just their high school but also their entire town—and they’re rumored to have powerful connections all over the world. If you’re not in love with one of them, you want to be them. Especially River: the loner, new girl at school. She’s different from her peers, who both revere and fear the Grace family. She wants to be a Grace more than anything. And what the Graces don’t know is that River’s presence in town is no accident. This fabulously addictive fantasy combines sophisticated and haunting prose with a gut-punching twist that readers will be dying to discuss. Perfect for fans of We Were Liars as well as nostalgic classics like Buffy the Vampire Slayer and the 1996 movie The Craft, The Graces marks the beginning of a new wave of teen witches. I’ll make this simple – THIS BLEW MY MIND. I didn’t expect this book to be this good or to have that ending and those characters that I fell in love with it, but it did and now I am nothing but Graces trash. Maybe I should be a bit more coherent? Then again, if I spell this out for you, it loses its charm doesn’t it? I’m a dramatic teenager, and in that spirit, I do have existential crises. Maybe I shouldn’t call them existential crises, but more of whole ton of insecurities. Meaning, for the longest while, and every now and then, I feel like there are other people that are just better than me. And once or twice, I’ve tried to befriended these better people, and I might have succeeded. So let me tell you, I know what River feels like. Sort of. That was one of the first things that drew me into this book. The Graces are those charming people – beautiful without trying, popular without effort, flawless as flawless can be – and River wants to be one of them. More than be one of them, she wants to be like them. Magical. Powerful. But magic is not gifted to everyone, illusions are sometimes all we see and the quest for power can break everything we are. Am I being cryptic? Hell yes. For I’ve tried and I can’t explain the magic this book might or might not contain. I can’t explain the spell it casts over you or why I like it, just that I do and that The Graces has a wonderful kind of magic to be wrapped in. I loved the supposedly flawed characters and the hold they had over everyone. Thalia, Fenrin and Summer Grace and THE MOST PEFECTLY SCREWED-UP characters I’ve ever known. I loved River and her intense need to be different and yet normal. I loved Wolf, with his background personality and Marcus, the boy in love. I loved how everybody was dealing with the same devil, just on different levels. I ADORED how magic was explained, because for the FIRST TIME, it wasn’t about the objects, or the wands, as Summer Grace said, but about the will behind it; the will to make the things you want happen. Most of all though, I loved that twist ending. 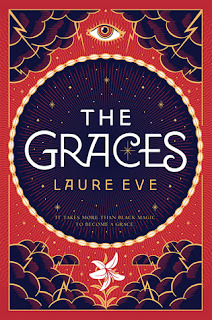 The Graces is a different kind of magic, and one you should immerse yourself in. What magical-realism books have you fallen in love with? Which is your favourite book that contains magic? It's my birthday TOMORROW, and there is NINE DAYS of giveaways lined up, so please be there!